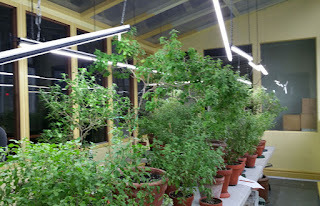 Tulasi House "Re-Opening" - Dec 26th @ 12:30pm ~ The Toronto Hare Krishna Temple! Worshiping Lord Krishna’s devotees is an essential feature of devotion to Him. Sometimes great devotees appear in forms other than the human form. One such devotee, whose worship is central to the worship of Krishna, is Tulasi. She serves Krishna in the form of a plant, and devotees worship her in that form. Full of love for Krishna, she can give it to others. Our beautiful Tulasi Greenhouse, which is located on the balcony level of our building has recently been undergoing renovations, repainting and more. There has been a tremendous amount of love, care and thought put into this very special part of our temple. On Monday, December 26, 2016, from 12:30pm to 2:00pm, we will be holding a mini "re-opening" of our Tulasi Greenhouse. Devotees are welcome to come attend the program which will include kirtan, a small talk and more. We hope to see you there!